Precision1 is a rather sensitive subject in geomatics: talk about it to a surveyor or a GIS specialist, and you better be armed with the right arguments to convince him to change his measuring devices! Let’s first look at optical sensors such as Pléiades (spatial resolution of 0.5 m) and the precision that can be obtained with this type of images. For example, in the case of an open-pit mining site, two digital elevation models (DEM) generated with photogrammetric techniques using stereoscopic pairs acquired on different dates can be compared with determine the location of changes in elevation corresponding to the extraction or piling of rocky material. It is generally accepted that the DEMs produced using Pléiades images, to use this example, have a precision in the order of decimetres. But this is far from being to the centimetre, not to mention the millimetre. For this reason, we must look at radar technology and a very specific way of processing these data. This involves technology known as “differential radar interferometry”, which uses radar images (at least two) taken on a given study site. 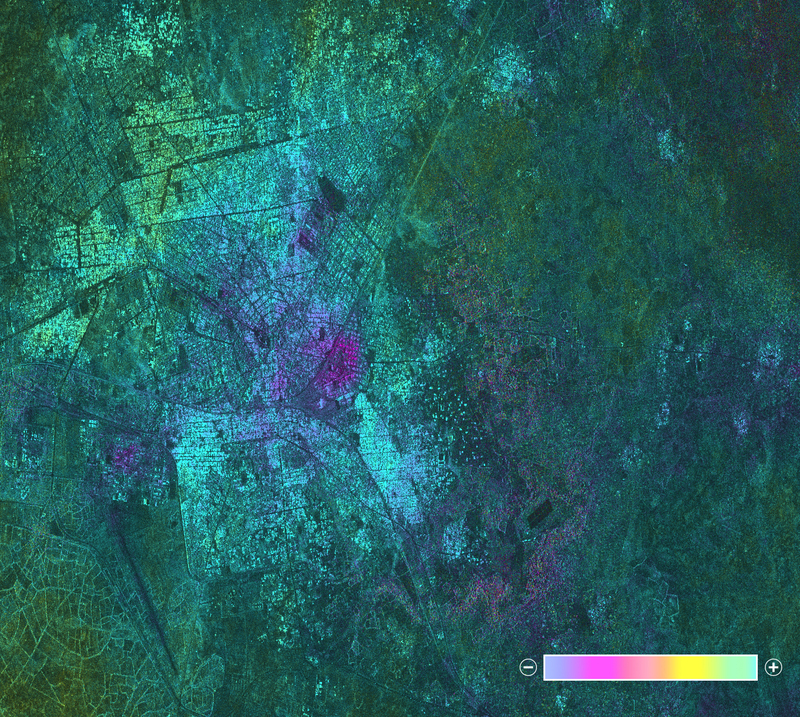 This technology makes use of synthetic aperture radar (SAR), which can operate at different wavelengths, i.e., at 6 cm for the C-band of the Canadian satellite RADARSAT-2, or at 3 cm for the X-band of the TerraSAR-X and COSMO-SkyMed satellites, to name but a few. 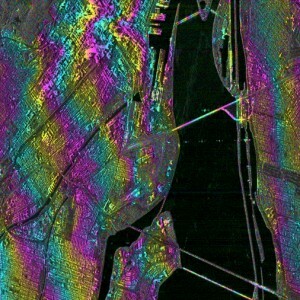 In addition to their use for studying the distribution of sea ice, the extent of flooding or even mapping wetlands, these SAR images may indeed be used to measure vertical displacements of the Earth’s surface to the centimetre or millimetre. And how is this possible? It is important to first know that SAR works by transmitting pulses toward the Earth’s surface and recording the portion which is reflected back to the sensor. To be more specific, SAR records the time difference between the transmitted pulse (short sinusoidal signal of centimetric wavelength) and the reception of the reflected energy, its intensity and its phase. In the case of mapping sea ice, floods and wetlands, intensity is of greatest interest. This intensity is based on several factors, including geometry, roughness and humidity of the target on the ground. In interferometry, it is mostly the phase that interests us. Indeed, the phase difference between the two acquisitions taken from different, but close orbits, known as an “interferogram”, provides for each pixel information on topography or ground deformation or displacement. In the latter case, we speak of differential interferometry (DInSAR), since we are interested in the movement that took place between the two consecutive images taken during a given time interval. 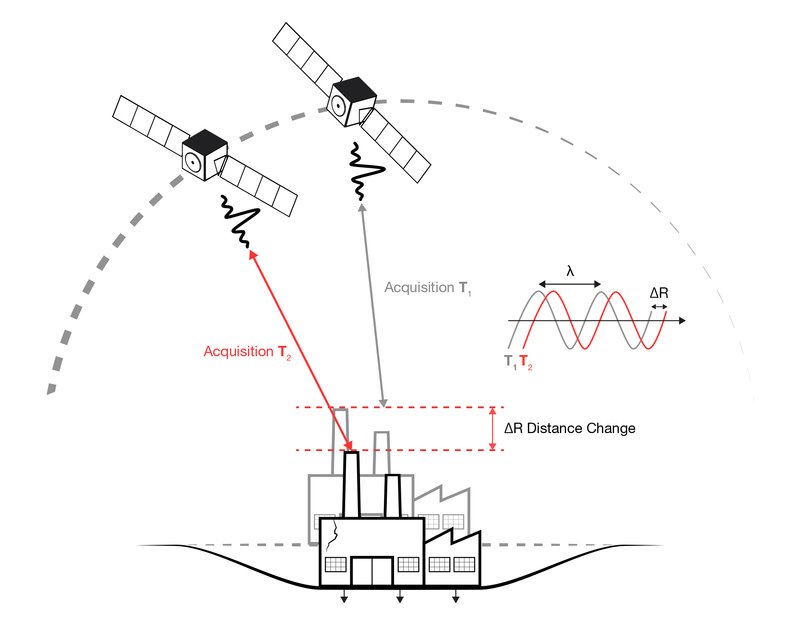 Simply stated, since the measurements obtained using interferometry correspond to the difference in the phase between two SAR acquisitions, precision is to a fraction of the wavelength of the sensor used. And this is where it becomes a bit complicated… the interferometric phase is the result of several factors in addition to the actual movement of the target on the ground. These factors are related to, among other things, the geometry of the satellite during the two passages (easily modelled using orbital data), the topography (may be calculated using a DEM), changes in the atmosphere (noise that can be difficult to eliminate) and changes in the characteristics of the target (such as humidity on the Earth’s surface, vegetation conditions or snow cover). Therefore, one must be able to take into account all these factors, which may cause a change in phase during the time between the two images that were used to produce the interferogram. Changes in the characteristics of the target on the ground between the two acquisitions, known as “temporal decorrelation”, is one of the most important factors limiting the application of radar interferometry, since it involves a loss in information regarding the phase between the corresponding pixels of the image pair. In cases like this, we would say that the coherence is low. This decorrelation is a result of the changes related to, for example, the growth or deterioration of the vegetation between the two dates. Therefore, it is important to work with stable targets on the ground (in terms of the radar echo and not in terms of movement), in other words, objects with high coherence, such as buildings, infrastructures, rock outcrops, etc. As for the noise caused by atmospheric effects, it may be reduced by filtering or using multiple interferograms, i.e., several images acquired on successive dates. In fact, it is customary to carry out several acquisitions in order to detect low-amplitude surface movements (or ground deformation) over various time periods. The multiple interferograms are processed as a temporal series whose trend allows us to estimate the rate (cm/unit of time) of surface deformation or displacement. With the various radar satellites currently in operation, the revisit frequency on a given site may vary between 4 and 60 days. Although it is impossible in certain cases to calculate ground deformation or motion from a given interferogram, primarily because of temporal decorrelation (for example, due to the presence of snow on one of the images), there are many other cases where multiple interferograms are available for which centrimetric or even millimetric precision can be obtained. This is how we can monitor volcanoes on a regular basis by detecting ground deformation related to heaving: relatively sustained movements may be indicators of an imminent volcanic eruption. Similarly, we can use radar interferometry to monitor land subsidence due to thawing permafrost in arctic and sub-arctic regions, or, when conditions allow, due to the extraction of natural gas or oil. It can also be used to monitor the stability of a retaining structure, such as a hydro-electric dam, electric transmission towers or other infrastructures. Radar interferometry has proven to be an especially valuable tool for obtaining information from remote (or dangerous) sites where other types of measurements would be very expensive. In my opinion, this state-of-the-art technology certainly has a place among the precision measurement tools used in geomatics. Contact us for information about our Earth Observation products or to take advantage of our expertise! Precision and accuracy are sometimes confused, so a definition of the two terms is provided to eliminate any doubts. Accuracy, in the context of SAR interferometry, can be defined as the degree or closeness to which the quantitative information derived from the interferometric data set matches the values in the real world. Precision is the degree to which repeated measurements under unchanged conditions show the same results. Although the two words can be synonymous in colloquial use, they are deliberately contrasted in the context of the scientific method, including in SAR interferometry. (Source: gislounge.com and wikipedia.org).